"This is the best pasta salad I have had. A friend at work gave me the recipe and I always get compliments whenever I make it." Bring a large pot of lightly salted water to a boil; cook rotini at a boil until tender yet firm to the bite, about 8 minutes. Drain and let cool, 10 to 15 minutes. Mix rotini pasta, tomatoes, cucumbers, olives, Italian dressing, Parmesan cheese, salt, and pepper together in a large bowl. Chill until flavors combine, about 1 hour. Toss avocado with lemon juice in a bowl. 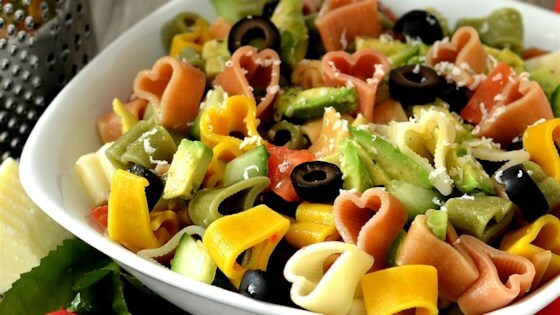 Mix into the pasta salad before serving. This was a nice light pasta salad. I added shredded romaine and made it with the italian dressing mix recipe off this site as well. Will definitely make again. Made this on Valentines Day for my sweetheart using five color heart shaped pasta. This turned out so good that it will go into my TNT folder. Thank you Steph for sharing this recipe. Yummy! Will make it again.